PLR 201425013: Two exemptions revoked or denied. A 501(c)(4) organization renting tables and chairs is not eligible for exempt status. A 501(c)(6) benefitting only one industry segment is not eligible for exempt status. PLR 201507025 (Nov. 18, 2014): IRS issued final adverse determination revoking Code Sec. 501(c)(4) org.’s exempt status, where org. didn’t operate exclusively for promotion of social welfare. The activities of the organization were to research, develop and distribute, free of charge, computer software that facilitates uncensored and secure communications by human rights activists, journalists, and civil society. The Patient Protection and Affordable Care Act, Pub. L. 111-148, 124 Stat. 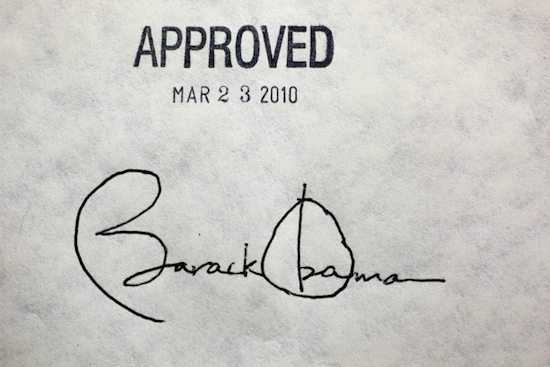 119 (the “Affordable Care Act”) (signed into law on March 23, 2010) provides for the creation of Accountable Care Organizations (ACOs). ACOs are intended to include participants such as governmental entities, section 501(c)(3) organizations and others. The purpose of ACOs is to facilitate the coordination of providing Medicare services. Several exempt organization and tax-exempt bond issues arise with respect to ACOs, certain of which are summarized or referenced in this post. There are concerns that (1) the participation by a section 501(c)(3) organization in an ACO is not an exempt purpose under the operation rules in Treas. Reg. 1.501(c)(3)-1(c)(1), (2) such participation could give rise to prohibited private inurement to insiders or exceed the limit on private benefits to others and/or (3) give rise to difficulties in applying the unrelated trade or business rules. See IRS Notice 2011-20 (March 31, 2011) for a good description of the issue and preliminary guidance. Apart from the concerns described above regarding the basic eligibility of a borrower for qualification under section 501(c)(3) of the Code, ACOs also give rise to problems under the private business use rules. Specifically, one question is whether use of bond-financed facilities by an ACO gives rise to a “comparable arrangement” covered by the private business use rules in Treas. Reg. 1.141-3(b). See the National Association of Bond Lawyers’ April 1, 2013 submission to the Treasury Department and Internal Revenue Service for a good description of the issue. See “Assessing the Impact of Citizens United: What Does it Mean for My Corporation?” by McKenna Long & Aldridge LLP. In rendering the opinion set forth in the first sentence of this paragraph, we have relied on the opinion of _______________________, counsel to the Borrower, that the Borrower has been determined to be an organization that is exempt from federal income taxation under Section 501(a) of the Internal Revenue Code of 1986, as amended (the “Code”), by virtue of being an organization described in Section 501(c)(3) of the Code, and is not a “private foundation” as defined in Section 509(a) of the Code, and to such counsel’s knowledge after due investigation, the Borrower has not failed to file a report with the Internal Revenue Service or engaged in conduct inconsistent with its status as an exempt organization. Why is it important to bond counsel’s opinion that borrower’s counsel opine on the private foundation status of the borrower? For purposes of I.R.C. 103 and 141-150, it is not relevant that a borrower is or is not a private foundation. For business purposes and continuing compliance reasons, however, it may be helpful to clarify the status of the organization. If it turns out that the borrower is a private foundation, this may be grounds for implementing stricter continuing compliance covenants or conducting more detailed tax due diligence to make sure the borrower has procedures in place to satisfy all of the special limitations applicable to private foundations. Section 511 (a)(1) of the Code imposes a tax on the unrelated business taxable income of organizations described in section 501(c). Section 512(a)(1) of the Code provides that the term “unrelated business taxable income” [UBTI] means the gross income derived by any organization from any unrelated trade or business [-> See 1] (as defined in section 513) regularly carried on [-> See 3] by it, less the deductions allowed by this chapter which are directly connected with the carrying on of such trade or business, both computed with modifications provided in section 512(b). Section 512(b)(5) of the Code provides, in pertinent part, that there shall be excluded from the computation of unrelated business taxable income all gains and losses from the sale, exchange, or other disposition of property other than: (A) stock in trade or other property of a kind which would properly be includible in inventory if on hand at the close of the taxable year, or (B) property held primarily for sale to customers in the ordinary course of the trade or business [-> See 4]. [1 (“Derived from Unrelated Trade or Business”) ==>] Section 1.513-1(d)(1) of the regulations provides that gross income derives from “unrelated trade or business,” within the meaning of section 513(a), if the conduct of the trade or business which produces the income is not substantially related (other than through the production of funds) to the purposes for which exemption is granted. The presence of this requirement necessitates an examination of the relationship between the business activities which generate the particular income in question-the activities, that is, of producing or distributing the goods or performing the services involved-and the accomplishment of the organization’s exempt purposes. Section 513(a) of the Code provides, in pertinent part, that the term “unrelated trade or business” means, in the case of any organization subject to the tax imposed by section 511, any trade or business the conduct of which is not substantially related [-> See 2] (aside from the need of such organization for income or funds or the use it makes of the profits derived) to the exercise or performance by such organization of its charitable, educational, or other purpose or function constituting the basis for its exemption under section 501 (c) (3). [2 (“Substantially” and “related”) ==>] Section 1.513-1 (d) (2) of the regulations provides, in pertinent part, that a trade or business is “related” to exempt purposes only where the conduct of the business activities has a causal (see TAM 200047049) relationship to the achievement of exempt purposes (other than through the production of income). Further, it is “substantially related,” for purposes of section 513, only if the causal relationship is a substantial one. For this relationship to exist, the production or distribution of the goods or the performance of the services from which the gross income is derived must contribute importantly to the accomplishment of exempt purposes. Whether such activities contribute importantly to such purposes depends, in each case, upon the facts and circumstances involved. Section 1.513-1 (d) (4) (iii) of the regulations states that in certain cases, an asset or facility necessary to the conduct of exempt functions may also be employed in a commercial endeavor. In such cases, the mere fact of the use of the asset or facility in exempt functions does not, by itself, make the income from the commercial endeavor gross income from related trade or business. The test, instead, is whether the activities productive of the income in question contribute importantly to the accomplishment of exempt purposes. Rev. Rul. 55-449, 1955-2 C.B. 599, states that the construction and sale of 80 houses by a foundation described in section 501 (c)(3) of the Code over a period of 18 months for the sole purpose of raising funds for the support of a church constitutes unrelated trade or business within the meaning of section 513, notwithstanding the fact that the organization did not plan to engage in further similar activities. Rev. Rul. 78-98,1978-1 C.B. 167, states that income derived by a Code section 501(3) school from the use of its ski facilities by students is not income from an unrelated trade or business. However, income that the school receives from the general public is income from an unrelated trade or business. PLR 201426029 (Jul. 1, 2014): Income received by an exempt organization from activities of its testing laboratory was not unrelated business taxable income (UBTI) under I.R.C. 511. The organization, which was exempt from tax under I.R.C. 501(c)(6) (Business League), was the subsidiary of a parent organization that was also exempt under I.R.C. 501(c)(6). The parent’s purpose was to create and maintain quality standards applicable to entire industries. The subsidiary was formed to conduct the testing and listing activities of the parent. Its main activities included a certification process by which it reviewed laboratory tests of products to be certified, physically inspected the products and physically inspected the plans where the products were made. Although the subsidiary conducted a trade or business for which it received fees, the revenue from that business was related to the organization’s exempt purpose. [3 (“Regularly Carried On”) ==>] Section 1.513-1(c)(1) of the regulations provides, in pertinent part, that in determining whether trade or business from which a particular amount of gross income derives is “regularly carried on” within the meaning of section 512, regard must be had to the frequency and continuity with which the activities productive of the income are conducted and the manner in which they are pursued. This requirement must be applied in light of the purpose of the unrelated business income tax to place exempt organization business activities upon the same tax basis as the nonexempt business endeavors with which they compete. Hence, for example, specific business activities of an exempt organization will ordinarily be deemed to be “regularly carried on” if they manifest a frequency and continuity, and are pursued in a manner, generally similar to comparable commercial activities of nonexempt organizations. [4 (“Trade or Business”) ==>] Section 513(c) of the Code provides, in part, that the term “trade or business” includes any activity which is carried on for the production of income from the sale of goods or the performance of services. Section 1.513-1(b) of the regulations provides, in pertinent part, that any activity of a section 511 organization which is carried on for the production of income and which otherwise possesses the characteristics required to constitute “trade or business” within the meaning of section 162 – and which, in addition, is not substantially related to the performance of exempt functions – presents sufficient likelihood of unfair competition to be within the policy of the tax. Accordingly, for purposes of section 513 the term “trade or business” has the same meaning it has in section 162, and generally includes any activity carried on for the production of income from the sale of goods or performance of services. unimproved land used for grazing purposes. The taxpayer subdivided the land into lots and made improvements such as streets, storm sewers, and gas and electric lines. Each year approximately 20 to 30 lots were sold. The court held that the taxpayer was holding lots for sale to customers in the regular course of business. Louisiana Credit Union League v. United States, 693 F.2d 525 (5th Cir. 1982) presents an extensive definition of the concept of unrelated trade or business. Although the finding of a profit motive is a key element, section 513(c) of the Code clearly states that any activity carried on for the production of income constitutes a trade or business. Note that gain/loss from a sale, exchange, disposition of property is not considered in calculating UBTI unless the gain/loss is from, essentially, inventory or property held primarily for sale to customers in the ordinary course of a trade or business. The conduct of such trade or business is not substantially related (other than through the production of funds) to the organization’s performance of its exempt function. In TAM 200047049 (see below), M classified its income received from students as non-taxable exempt purpose income and from non-students as taxable income, relating to the use of the golf course. The IRS agreed that this classification is appropriate in that the golf course is part of the educational and developmental experiences offered by M to its students, and student use of the golf course (and the other facilities) serves the objective of providing such experiences and contributes importantly to the exempt purposes of M. The IRS further agreed that use by non-students did not serve this objective and did not further the overall educational purposes (since the non-student users were not students). Re: Causal Relationship: In TAM 200047049, the IRS found that there was no “substantial causal” relationship between the land sales and the provision of educational services by M, in particular because M did not select buyers based upon their anticipated involvement in its activities. Instead, the sole criterion appears to be the amount of the buyer’s offer. Thus, it appears one must ask “what are the criterions used by taxpayer for engaging in the activity?” – if the criterions have nothing or little (see TAM) to do with the exempt purpose, this indicates there is a lack of causal relationship. Even if there is any connection, it would be so ancillary to the principal purpose. Technical Advice Memorandum 921102 (September 30, 1991): Addresses: (1) Whether school is operating for exclusively educational purposes within the meaning of section 501(c)(3) of the code; (2) whether the school meets the definition of an educational organization under section 170(b)(1)(A)(ii) of the code; (3) if the school is operating in accordance with section 501(c)(3) of the code, whether the school’s contracts with foreign governments constitute unrelated trade or business activities within the meaning of section 513(a) of the code. Priv. Ltr. Rul. 199905027 (November 3, 1998): Requesting rulings that: (1) M’s (an organization created to administer programs of student financial assistance and for other matters) activities pursuant to a certain contract with state education assistance authority (“N”) for a state savings fund (“O”) are substantially related to M’s exempt purposes to not adversely affect M’s exempt status under section 501(c)(3) of the code; (2) income earned by M pursuant to such contract is not subject to tax under section 513 of the code (unrelated trade or business tax); (3) M meets the requirements as a supporting organization within the meaning of section 509(a)(3) of the code; (4) [other matters not relevant to this posting]. Technical Advice Memorandum 200047049 (August 2, 2000): (1) Whether income derived by 501(c)(3) organization (“M”) (which operates some type of “commune” or historical town) from the sale of land constitutes unrelated business taxable income under section 512(a)(1) of the code; (2) whether M’s provision of municipal-type services in the manner described serves the private interests of M’s members in contravention of section 501(c)(3) of the code, and, if not, whether income derived by M from providing such services constitutes unrelated business taxable income under section 512(a)(1); (3) whether income derived by M from the provision of a golf course, tennis court and boating facilities constitutes unrelated trade or business taxable income under section 512(a)(1) of the code, and what factors are relevant in determining whether such activities further an exempt purpose under section 501(c)(3); (4) if any of the above-mentioned activities constitute unrelated trade or business under section 513 of the code, whether such activities adversely affect M’s tax-exempt status under section 501(c)(3) of the code. PLR 201603032 (Oct. 9, 2015): Exempt organization that directly or indirectly builds, develops, finances, purchases, rehabilitates, owns, sells and operates affordable housing for persons of low or moderate income including but not limited to elderly persons with a need for housing, health care, financial security and assisted living. The organization has an investment in and is a managing member of LLC. LLC operates the affordable housing project hat qualifies for low income housing credits under I.R.C. 42. Operation of the project is LLC’s only activity. Will the rental income the organization derives from the LLC after the organization’s acquisition of additional membership interests in LLC (which will result in organization owning 100 percent of LLC) constitute unrelated business income subject to unrelated business income tax? Will organization’s acquisition of additional membership interests in LLC constitute a recapture event under I.R.C. 42(j) for the low income housing tax credit allocable to the LLC? Will the organization’s acquisition of additional membership interests in the LLC subject the organization to excess business holdings tax under I.R.C. 4943? Will the project operated by the LLC, the activities of which will be attributed to the organization, meet the safe harbor in Rev. Proc. 96-32 and will continue to do so after the organization’s acquisition of all of the membership interests in the LLC, and will these activities therefore further the charitable purpose of relieving the poor and distressed under I.R.C. 501(c)(3) and the regulations thereunder? You are currently browsing the archives for the 501 – Exempt Organization category.